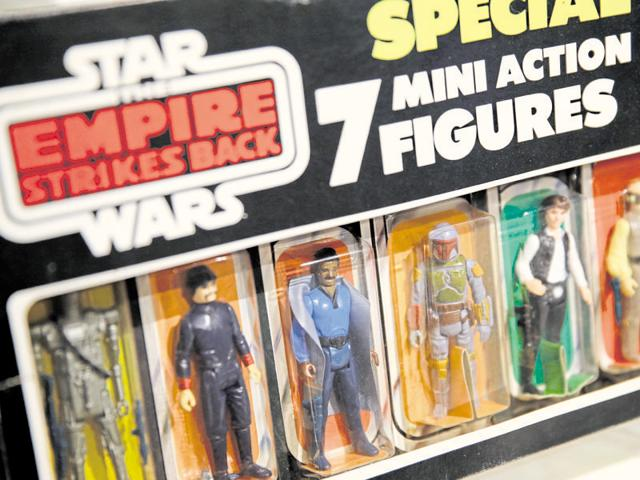 More than 600 items will go on sale in an online auction organized by Sotheby's and eBay on December 11 - one week before the release of 'Star Wars: The Force Awakens', the seventh movie in arguably the world's biggest film franchise. Harrison Ford as Han Solo. Ford said Han "does not aspire to the position of Obi-Wan, nor do I aspire to be some New Age Alec Guinness. His development is consistent with the character, and there are emotional elements which have occasioned his growth ... There's a lot of the rogue still left in Solo. Some things don't change...". Mark Hamill as Luke Skywalker. Regarding Luke, Han and Leia, Abrams stated: "They'd be as old and as mythic as the tale of King Arthur. They would be characters who [the new characters] may have heard of, but maybe not. They'd be characters who they might believe existed, or just sounded like a fairy tale...". Carrie Fisher as General Leia Organa. She is referred to as General Organa, rather than Princess Leia - and is shown to still be Force-sensitive. After the events ofReturn of the Jedi, she is described as "a little more battle weary, a little more broken hearted." Fisher described Leia as "solitary. Under a lot of pressure. Committed as ever to her cause, but I would imagine feeling somewhat defeated, tired, and pissed." Abrams said: "The stakes are pretty high in the story for her, so there's not much goofing around where Leia's concerned". Adam Driver as Kylo Ren, a dark warrior strong with the Force, originally a member of the Knights of Ren, and commander of the First Order. Driver said the team tried "not to think of him as being bad, or evil, or a villain. Something that was more three-dimensional. He’s more dangerous and unpredictable, and morally justified in doing what he thinks is right." Daisy Ridley as Rey, a scavenger on the desert planet Jakku, who discovers that she is very Force-sensitive. Ridley said: "She's completely self-sufficient and does everything for herself, until she meets [Finn] and an adventure begins." John Boyega as Finn, a redeemed First Order stormtrooper. Boyega said that he learned he obtained the part "over a nice breakfast in Mayfair" where Abrams told him: "John, you're the new star of Star Wars." Boyega said: "When we find Finn, he's in incredible danger. And the way he reacts to this danger changes his life, and launches him into the Star Wars universe in a very unique way." He said in another interview: "He's been taught about [Luke], he knows about his history. For him it's like joining the army and then learning about one of the great enemies of your country." Oscar Isaac as Poe Dameron, a Resistance X-wing fighter pilot. Isaac said: "He's the best freaking pilot in the galaxy... He's been sent on a mission by a certain princess, and he ends up coming up across [Finn], and their fates are forever intertwined." Lupita Nyong'o as Maz Kanata, a pirate. Nyong'o said Kanata has "lived over a thousand years. She's had this watering hole for about a century, and it's like another bar that you'd find in a corner of the Star Wars universe." Andy Serkis as Supreme Leader Snoke, Kylo Ren's master and a powerful figure of the dark side. Serkis described Snoke as "quite an enigmatic character, and strangely vulnerable at the same time as being quite powerful... He is large. He appears tall. And also just the facial design – you couldn't have gotten there with prosthetics... Without giving too much away at this point, he has a very distinctive, idiosyncratic bone and facial structure." Domhnall Gleeson as General Hux, leader of the primary First Order base, Starkiller Base. Gleeson described him as "pretty ruthless. A strong disciplinarian would be a mild way of putting it... He's kind of opposite Kylo Ren. They have their own relationship, which is individual and unusual. One of them is strong in different ways than the other. They're both vying for power." Anthony Daniels as C-3PO. Daniels said the actors were allowed to experiment with their performances, and that Abrams "made a field, a playpen where you were allowed to take your time and suggest things". Tim Rose and Mike Quinn reprise their roles as Admiral Ackbar and Nien Nunb, respectively from Return of the Jedi. Quinn previously performed Nien Nunb with Richard Bonehill before his passing, while Kipsang Rotich provided the character's voice. Kenny Baker served as "consultant" for R2-D2. Gwendoline Christie stars as Captain Phasma, an officer in the First Order. Dave Chapman and Brian Herring served as puppeteers for BB-8, with Bill Hader and Ben Schwartz credited as "Vocal Consultants". Ken Leung appears as Statura, an admiral in the Resistance. Simon Pegg appears as Unkar Plutt, the Junkyard dealer on Jakku. Greg Grunbergplays Snap Wexley, an X-wing pilot. Kiran Shah plays Teedo, a scavenger on Jakku who rides a semi-mechanical Luggabeast. Jessica Henwick stars as Jessika "Jess Testor" Pava, an X-wing pilot. Yayan Ruhian, Iko Uwais and Cecep Arif Rahman appear as Tasu Leech, Razoo Qin-Fee, and Crokind Sand, members of Kanjiklub Gang, a criminal organization. Warwick Davis appears as Wollivan, a tavern-dweller in Maz Kanata's castle. Thomas Brodie-Sangster plays Thanisson, a First Order Petty Officer. Billie Lourd appears as Connix, a lieutenant in the Resistance. Star Wars: The Force Awakens is a 2015 American epic space opera film directed, co-produced, and co-written by J. J. Abrams. 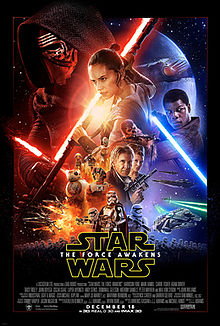 The seventh installment in the main film series, it stars Harrison Ford, Mark Hamill, Carrie Fisher, Adam Driver, Daisy Ridley, John Boyega, Oscar Isaac, Lupita Nyong'o, Andy Serkis, Domhnall Gleeson, Anthony Daniels, Peter Mayhew, and Max von Sydow.